The Volvo Ocean Race is an epic race around the world, visiting 12 cities and touching six continents and for the first time in its history the race will stop in Cardiff from 27 May to 10 June 2018. – The Volvo Ocean Race is an epic race around the world, visiting 12 cities and touching six continents. The fleet set off from Alicante, Spain on October 2017 and sailors will leave Newport, Rhode Island, U.S., on May 20 for the race”s transatlantic leg and will cover approximately 2,900 nautical miles until they reach Cardiff. The transatlantic leg is traditionally one of the nine-month event”s biggest highlights and toughest tests for sailors in often challenging conditions. Antonio BolaÃ±os LÃ³pez, acting CEO, Volvo Ocean Race, said: “The transatlantic race between Newport and Cardiff promises to be one of the real highlights of the Volvo Ocean Race 2017-18. 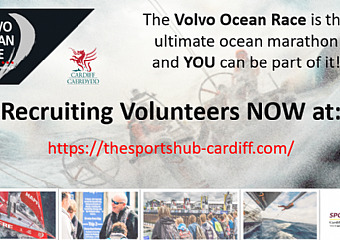 The Volvo Ocean Race festival site, called the Race Village, will be located on the scenic Cardiff Bay Barrage. The two week free event will host a variety of entertainment and Volvo Ocean Race-themed attractions. We are looking for hundreds of volunteers who are willing to give their time, skills, and energy to support this prestigious event. Most role do not need any sailing expertise so as long as you have some enthusiasm and a willing attitude we would love to hear from you!